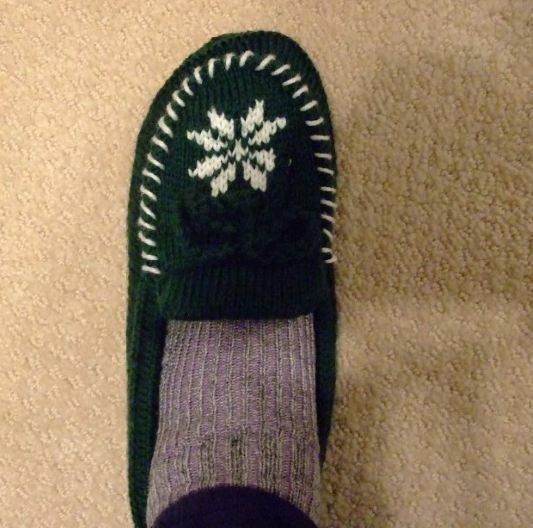 Since I got into the “slipper mode” a few weeks ago, I have been playing around with ideas to warm my cold feet. The howling winds outside and the snow covering the ground, are constant reminded to get busy, so I forged ahead. 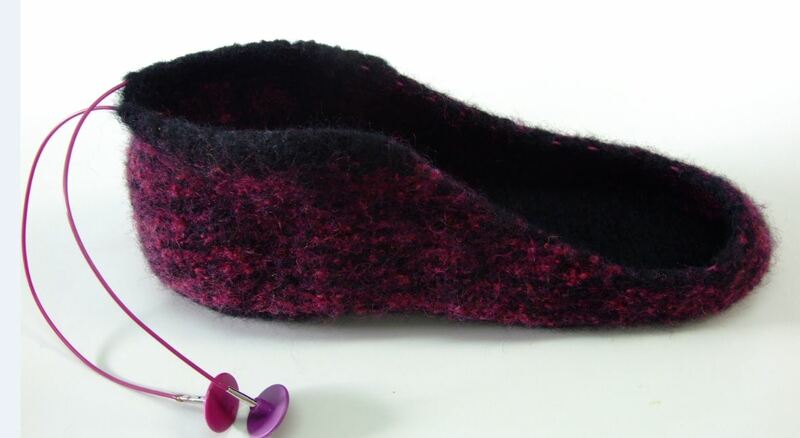 Tonight I finally finished my new design, for a partially felted slipper. Why, partially? Its sole and sides are felted, while the upper toe and instep area is twined knitted in wool. The ankle and upper leg are ribbed, then the leg warmer cuff is knitted with a fun fur and 4 ply wool knitted together. It will be after the holidays before I get the pattern written up, but thought you might like to see it anyway. The leg warmer section can be as long as you like. I’ve already decided I will make this section about 12 inches, so I can pull it up when things get really cold; otherwise it just stacks neatly on the top of the foot. As you can see in the photo, I used two colors in the felted area, while using two strands of black in the sole. 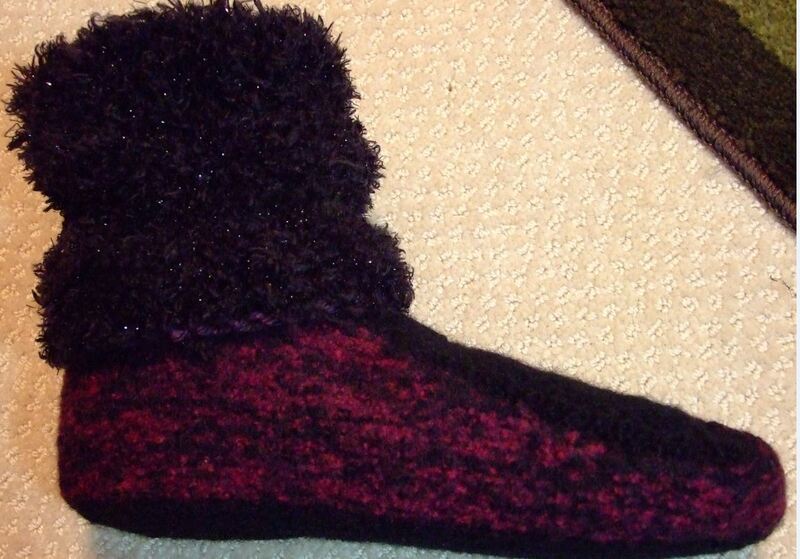 Below is a peek at the felted section before the knitted upper toe and instep area was attached. I felted this by hand, leaving the circle needle cords in the finishing stitches. 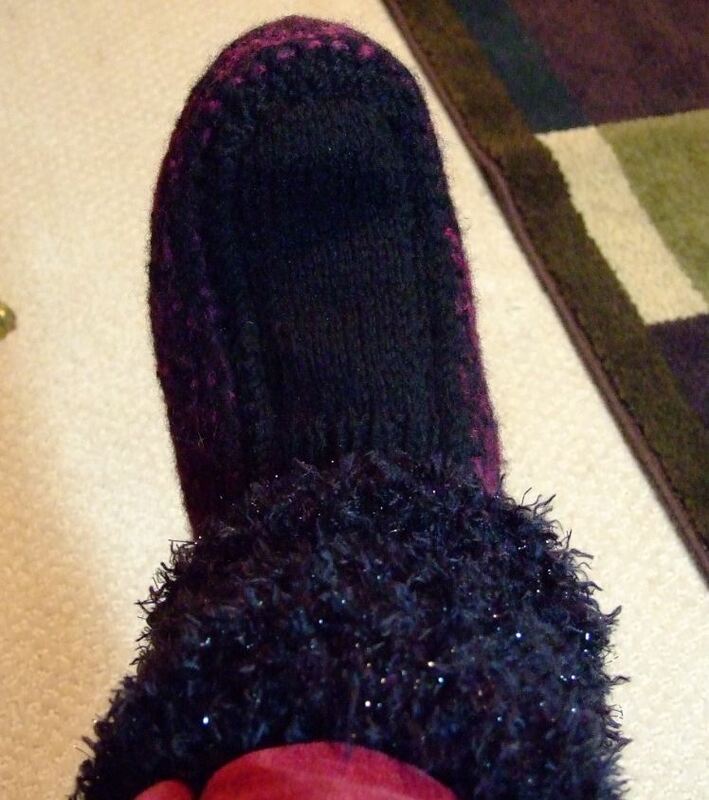 Last night I finished another slipper. This time I tried using the loop stitch on the upper toe section. I am thinking about designing one for my husband as well. Will upload the pattern as soon as I get it done.